Bach Flower Consults Online is run by Linsey Denham and this page lets you know a bit about me and to put a face to the name. I spent my twenty six year, nursing career (bar four years) looking after sick babies and children which meant caring for whole families. This gave me a huge catalogue of experience for helping all ages deal with anxiety, stress and illness. My passion was always the 'emotional support' side of nursing and my career ended, doing just that. I had given up clinical nursing because I had become too 'soft', after years of working on my own emotional health. My wide open heart felt no longer able to distance itself from the physical pain of the kids I was looking after. I had planned to set up my Bach practice then but received a call which delayed that plan by a year. A charge-nurse in the Edinburgh Sick Kids' ITU, where I had worked for the previous thirteen years, knew my passion for family support and told me that they were creating a centre to support families and would be looking for a manager. Manager being too much for me to contemplate, I applied for assistant manager and got the job. Once its doors opened, in May 2006, after nearly five months in the job doing preparation-work, my job greatly involved giving emotional support to the children and families who came through the door. These families were experiencing a varied range of illness including cancer, cystic fibrosis, asthma and diabetes. There were also families dealing with the turmoil of having a child admitted into the intensive care/high dependency/neonatal units. It didn't really matter what the illness was, though, these parents and families were all suffering for the same range of emotions. Despite loving the emotional support I could give in my job, I was frustrated because I was unable to pass on my knowledge of the Bach Flower remedies and how they could help these families to get through the stresses of hospital-life and illness in general. It was against policy.......a policy I couldn't reconcile with. Our team of two was not working out either, probably because we had very different viewpoints and I think that it was the Universes big nudge to get me out of there. I also desperately missed being at home for my kids. A Monday to Friday job was just not for me. After much soul-searching, I concluded that many people could do my job at the Drop-in centre and that I would be of better service being a Bach Practitioner, offering my knowledge of the flower remedies to give emotional help to those who needed it. I resigned my position and set up my Bach Practice from home. My greatest gift from my year in that job was meeting Lorraine Murray who became my Reki Master. I have since completed my Reiki master and teacher levels of training with her. It is thanks to her that I am now able to channel Reiki healing energy for my clients to draw for themselves and to teach others how to use this wonderfully simple method of healing. Lorraine was also my bridge into teaching adults and children meditation. So, here I am. A nurse no more but with my years of experience in supporting people now being utilized through the gentle, healing properties of the Bach flower remedies, mindfulness meditation and Reiki. I have been a qualified Bach Foundation Registered Practitioner (BFRP) since the summer of 2005, but have used the remedies for myself and my friends/family since my discovery of them, a few years before. 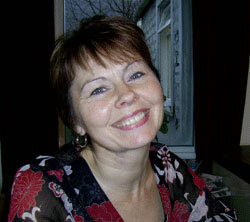 I became a Reiki practitioner in the Spring of 2007. My meditation teaching has evolved through my other teaching but I am a qualified Connected Kids tutor. I have experience of working with all age groups from the very young to the very elderly. Growing up in Craigmillar (one of Edinburgh's poorer areas) and working for a wealthy Canadian couple (as a nanny ) has given me a very balanced viewpoint. I consider myself very lucky to have been able to see life through such different lenses. Apart from 7 years in Canada (which included the nanny bit, a marriage, a divorce, the birth of my son and taking out Canadian citizenship) I have always lived in East Edinburgh. That changed in August 2014 when I moved back to Toronto with my 2 daughters (16 and 20) so that the youngest could finish her high school education with more drama, literally, at the Etobicoke School of the Arts. I am happy to be living closer to my son (22) who's spent 3 of the past 4 yrs living here but not so happy that, for now, my husband is still in Edinburgh, working hard to support two homes. That last sentence will be hopefully updated over the coming months..........or I may just write some blogs. My Bach Flower remedy story? Well, having lived with chronic back-pain for many years (and taking anti-depressants for the 3rd time) I was lead to the Bach Flower Remedies by a friend, who gave me her Bach practitioner’s phone number. The remedies replaced the anti-depressants and provided me with the emotional support I needed from that time forward and for that I will be eternally grateful. The Bach Flower Remedies did not erase my back-pain but simply changed my perception on my ability to live with it. The wonderful Bach practitioner I saw for nine months told me on day one. 'Linsey, I can't take away your back pain but I can help you feel differently about it'.......and I never looked back, if you'll pardon the pun. Convinced of the healing abilities of the flower remedies (my husband thought that he had a new wife) I wanted to become a Bach practitioner so that I could help others in the same way that I had been helped. My first goal has almost been accomplished with two of my three children now adults and still happy to spend time with their parents. My youngest still happily communicates with us and walks on the same side of the street, even taking my hand occasionally,if the mood so takes her! My ties with the Sick Kids in Edinburgh allowed me to introduce the remedies into the hospital for staff use, after a very successful funded trial. Thus my second goal was achieved, if only for a few years. Funding was unavailable to continue long-term but I am glad to say that several of the nurses continue to use Bach remedies and a couple have even joined me to learn the Level 1 Bach course.....from me. They may be the folk to spread Bach further into the NHS because they are in positions to reach the children and families as well as the staff. I added a third goal, which was that of helping teachers and pupils alike, in the education system. I made great progress with that goal before leaving Edinburgh, doing sessions of mindfulness meditation for both senior pupils and for staff in my kids' high school. These sessions allowed me to introduce the Bach flower remedies as a way to diminish stress and a school-fundraiser for student mental-health provided me a way to buy a full set of remedies for the school. The school is in the great position of having a matron who has completed her level 1 Bach training with me thereby enabling her to mix the remedies that the staff or pupils need. Occasionally I receive a message, asking for Bach advice, so I know that the box is not sitting on a shelf simply gathering dust. I'm convinced that I was given 3 kids of my own to practice on and seeing their emotional wellbeing benefit, from using the remedies, I am keen to help other youngsters who may be struggling with their (usually normal) teenage emotions. My Reiki developed after receiving guidance to do the level 1 Reiki course myself, for emotional protection and healing. I had such profound experiences with my own self-healing that I knew that I wanted to progress to being able to offer Reiki healing to others. I am now not only qualified to do this but am also qualified to teach others how to use this healing therapy in their own lives. I run level 1 and 2 courses for 2-4 people. I mostly only organise a course when someone asks me to teach them. I love empowering others to take charge of their own healing and helping them realise that they are unique, special, important individuals. Reiki has allowed me to open myself up to the receiving and giving of love. It has also helped me to accept responsibility for my life in general but my health in particular. Like the Bach flower remedies, Reiki is a gentle, safe, non-invasive form of self-healing and combining it with the remedies creates the perfect combination for continuous self-healing. As an individual, I have my 52 years of personal experience to draw on, which helps me to have empathy with many of my clients. This experience includes but is certainly not limited to, divorce, living in a foreign country, close bereavement, chronic pain, depression, parenthood, alcoholism, caring for a parent, and work-place stress. These experiences have helped me to be able to offer myself to clients as a safe, supportive place for revealing their feelings to themselves and to me. I don't even have to know the situations that clients are living through, if they'd rather not share. All I need to know, to help a person 'feel' better, is how they are currently feeling or sometimes, how they'd rather be feeling.